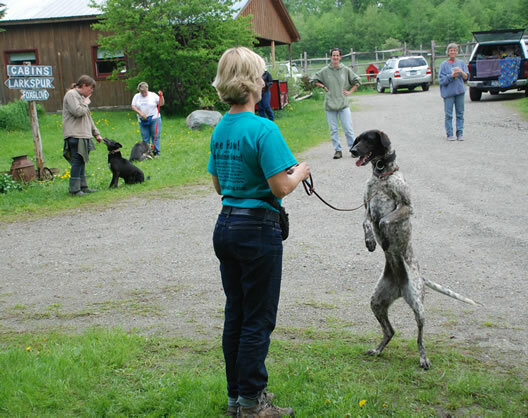 Intensive Hands-on 5 Day Working Internship at Eden Mountain, Vermont Lodge and Dogsledding Kennel with Sue Sternberg and Leslie Burgard, CPDT, and Jim Blair, owner. This internship was amazing to say the least! The teachers were not only fantastic instructors but extremely knowledgable and highly educated in their fields with a vast amount of hands-on experience working with dogs. On top of this, the location and scenery were breathtaking! Of course let’s not forget the dogs…Wow, which one can I take home with me! They couldn’t wait to come out and work with us and were more than happy to learn a few new tricks. But, when it was time to harness them up for sledding, look out! there’s no keeping 4-on-the-floor during this process. They are “Amped” and ready to go! To the right is me with “Amp” a German Short Haired Pointer–Huskie cross. Amp was a bit of a challenge to harness up to the line, but boy, she was fast as a whip pulling the sled! Just below that, all harnessed up and ready to go! Sue Sternberg is renowned for her study and expertise with aggression in dogs. Under Sue’s tutelage we did extensive field research, observing and studying body language and interactive behavior among 35 working sled dogs. Through lecture, videos and hands-on work, we learned how to assess puppies and dogs through temperament testing. We also studied video footage on dog-to-dog interaction and aggression, learning how to interpret what is healthy play, risky play, and dangerous, more aggressive play. We also learned the various techniques for handling dogs that could potentially be or are aggressive. Leslie Burgard, CPDT of Dogs Think! is a professional dog trainer and behavior consultant with 20 years of experience. Leslie showed us a variety of training techniques and how to teach, run and facilitate a variety of dog training classes. Under Leslie’s instruction and guidance, each of us were assigned 3 sled dogs to work with one-on-one to teach a variety of obedience exercises and a few tricks. Jim Blair (right bottom image) is the host and owner of Eden Dog Sledding. Jim is an international and national champion sprint sled dog and skijor champion. Not only an incredible athlete, but also an amazing instructor of skijoring and dog sledding. We learned all about caring for 35 sled dogs from meals to health and medical care. He also instructed us on how to assemble a dog team, harness them and hitch them up for sledding. Jim’s dogs are all free-range, meaning they run free in their open kennel runs. They are not chained to their dog houses like most traditional sled dogs. These wonderful dogs are known as the “Un-Chained Gang” and boy do they love their daddy! Aside from the vast amount of information and knowledge I came away with from this internship, I’ve never had so much fun in my life! The sled rides were invigorating to say the least, I couldn’t stop smiling throughout the entire run! 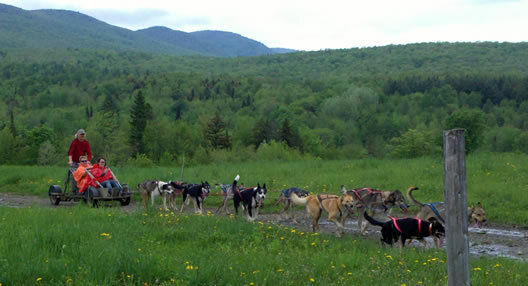 Eden Dog Sledding is also an exciting and adventurous vacation spot any time of the year. You will not only learn about the sport of dog sledding, meet the dogs, and harness and hitch up your own dog team, you will also experience the ride of your life being pulled by these amazing animals! I highly recommend it. It’s an experience you’ll never forget, and fun for all ages. Visit their website for more information and tell Bill Leigh sent you! West Cost Dog Training services include puppy/dog obedience training, behavior modification, dog walking and pet sitting/boarding. Dog walking services cover Corte Madera, Greenbrae, Kenfield, Larkspur, and Ross. Dog training services include all of Marin, in addition to the above areas, Belvedere, Fairfax, Mill Valley, Novato, San Anselmo, San Rafael, Sausalito, and Tiburon.